It is possible to make a "necklace" of 64 beads for choosing a hexagram. It seems there are more than 60 million possibilities for the sequence, so each necklace can be different from every other one. A necklace like this will not give you changing lines. But if you make one with 4 different beads, a color for every kind of line - old yang, young yang, old yin, young yang - you can choose hexagrams with changing lines. 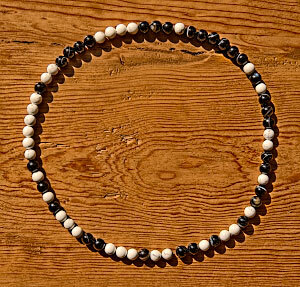 For a "yarrow-stalk" neclace, you need 1 old yin, 5 yang, 7 yin and 3 old yang beads or a multiple of this ratio. For a coin-probabilities necklace 1 old yang, 1 old yin, 3 young yang, 3 young yin, or a multiple of this ratio.